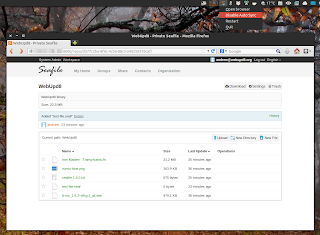 Seafile, an open source cloud synchronization and collaboration tool, somewhat similar to Dropbox, ownCloud or SparkleShare, that you can install on your own server, has been updated to version 1.6.0 recently, getting some interesting new features such as a Wiki module and more. For more about Seafile (features, etc. ), see our initial article. online rich document editor and improved markdown editor. The Seafile desktop client has received various bug fixes as well as support for symbolic links. There were also changes made to the Android client (called "Seafile+", is open source but costs $1) which has received an improved UI as well as support for editing and uploading files. And finally, the iOS client has received some bug fixes. 100GB of storage space with no group or member limit for $50/month. Seafile (server) runs on Linux (Debian, Ubuntu, Centos and Raspberry Pi), Windows and Mac OS X while the Seafile client is available for Linux, Windows, Mac OSX, Android and iOS. See the Seafile wiki page for how to install Seafile Server | upgrade Seafile Server.